KETO ELITE Tri Protein -All of what you need, none of what you don’t! 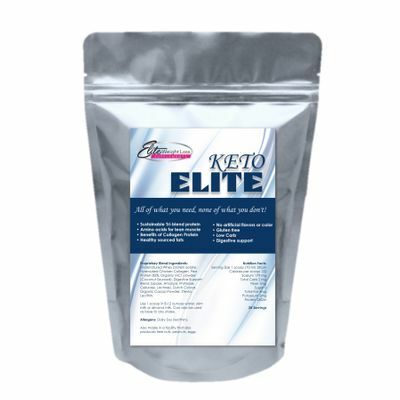 Keto Elite is manufactured with the highest quality Organic ingredients. We also use undenatured whey protein isolate which means it hasn’t been modified. –Supports Liver Detoxification: Collagen is rich in glycine, an amino acid needed to support neutralization of toxins in the liver. In today’s über toxic world, often the body cannot make enough glycine to keep up with your detoxification needs (a toxin is anything from chemicals, food additives, alcohol, recreational drugs, RX drugs, BC pill, etc). –Therapeutic for Digestion: Regular consumption of bone broth, gelatin, or collagen is very therapeutic for digestive disorders including food allergies, Celiac disease, Crohn’s disease, Colitis, IBS, and lack of stomach acid. –Fights Lactose Intolerance: When consumed with dairy, collagen can improve dairy digestion for those lactose-intolerant individuals. –Skin and Beauty Support: Collagen protein is very beneficial to the skin and can increase elasticity! Sourced information from Pubmed.gov, Raypeat,Townsletter. What Pea Protein can do for you! If you cannot ever drink animal based protein powders due to a pre-existing allergy or intolerance, pea protein is a great choice to drink regularly. This is why we have a tri blend of proteins and sustains your appetite longer due to the difference in the time your body digests each one. While whey protein isolate is pretty much lactose free, some of you cannot tolerate the small amount it sometimes contains. Pea protein is a great substitute. It is completely free of lactose, the sugar found in some types of whey protein powder that causes those of you who are intolerant to it to feel bloated and gassy. Our Whey protein is also an Isolate which is the easier to digest. Keto Elite only the Best Whey Protein Isolates! as an ingredient in many types of food, including meats, dairy products, candy and beverages. When compared to concentrated whey protein, whey protein isolate has higher protein content and little, if any, fat or lactose, according to the National Dairy Council. protein, which means it has all of the amino acids that are needed in a daily diet. It contains high levels of branched chain amino acids. Branched chain amino acids are unlike other amino acids in the promotion of muscle growth because they can be metabolized directly into muscle tissue. Whey protein isolate contains a high level of leucine, which promotes the synthesis of muscle protein and muscle growth. It also promotes the loss of fat tissue because of the energy the body needs to process leucine. When compared with soy protein isolate, whey protein isolate has 50 percent more leucine. Whey protein isolate has a high level of cysteine. According to the Whey Protein Institute, whey protein boosts the immune system. It does this by elevating the body’s level of glutathione. Women with the highest levels of plasma cysteine have a reduced risk of breast cancer when compared with the women with the lowest levels of plasma cysteine. Whey protein can help control blood glucose levels, and it can help people who have diabetes control their diets. For pregnant women, who have an increased need for protein, whey protein isolate provides a rich source of protein. Whey protein may also help prevent bone and muscle loss in senior citizens. What is Coconut derived MCT ? Coconut oil is one of nature’s best sources of medium-chain triglycerides (MCT’s) which play a key role in the body’s metabolism of fats and energy production. MCT’s are more rapidly absorbed by the body and more quickly metabolized as fuel. A 2-tablespoon serving of coconut powder contains 2 grams of fat, all of it as saturated fat. However, coconut fat contains medium-chain triglycerides, which may help raise high density lipoprotein levels, also known as “good” cholesterol. Glucose intolerance may cause manganese deficiency in your body. Coconut milk powder is a rich source of manganese. Whole grains, legumes and nuts are some other excellent sources of manganese. Coconut milk Powder is not rich in calcium, but it is rich in phosphorus. Phosphorus is an essential nutrient that the body needs for strengthening bones. It is must to take phosphorus with calcium particularly to prevent bone loss because it supplies phosphate to the body. Lack of iron is the most common nutrient deficiency among the people throughout the world. Iron deficiency in body does not allow the body to develop enough hemoglobin for keeping sufficient oxygen levels in red blood cells, resulting in anemia. Each cup of coconut milk Powder supplies the body with nearly a quarter of daily value of iron. Whenever you feel muscle cramps or muscle soreness, have some food along with coconut milk Powder. It is rich in magnesium and can help you in relieving the problem. One of the functions of magnesium is it acts as a gate block in many nerve cells. If magnesium is not present in body, nerve cells become very active because of calcium that activates nerves. Excess contraction of muscles is caused by over-active nerve cells. This can be good news for people who are trying to reduce weight. Coconut milk Powdermakes you feel full very quickly because of high concentrations of dietary fiber. People who are concerned about their blood pressure will not face any problem consuming foods containing potassium. Potassium helps in lowering blood pressure levels in the body. Coconut milk Powder helps in warding off colds and coughs by keeping the immune system healthy. It supplies vitamin C to the body which boosts the immune system. Zinc plays a vital role in promoting the health of prostate gland. A preliminary study showed that it slows down the activities of cancer cells. SOURCED FROM WEB MD, LIVESTRONG, MAYO CLINIC.